I personally view my products as "wearable floral art", not jewelry. That last word in the company's name is for simplicity and identification in a general sense only. The settings for my pieces are merely the vehicles to display the flowers themselves. Much like how a painter's canvas is the vehicle for which the painted picture may be showcased, or how a tee shirt is the vehicle for a screen printer's eye-catching design. My art therefore is in my flowers, their preservation and presentation. 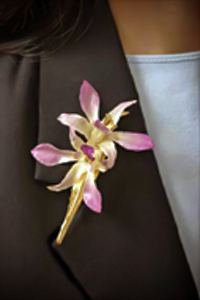 The backing - while pretty - is only there to hold together the true artistic focal point: the real wearable flowers. ← New Products! New Designs!